We had an insane run at Cypress Mountain this morning. 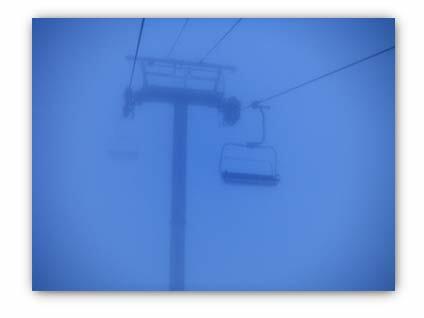 I’ve boarded in foggy conditions before, but nothing like what we encountered this morning on the first run. MB and I were excited to be making first tracks again, but it became immediately obvious after we stepped off the Lions Express chair that it would be slow going. It was totally nuts. I couldn’t see more than 2 metres in front of me, and subsequently was going dead slow. What I could see was pretty much just white on white. Goggles didn’t help, and other boarders (very few of them) loomed into sight at the last minute. I quickly discovered that when you can’t see, your sense of balance gets totally messed up (d’oh). I found myself sliding sideways across the hill when I thought I was going down. I wiped out a number of times on simple turns even though we were on a green run (after bailing off a blue). What if found was that I had no sense of how far I was leaning into the turn, and no proper sense of when to pull out. Very very disconcerting, and a bit frightening. I can certainly see how people get lost and disoriented in white-outs or heavy snowfalls. 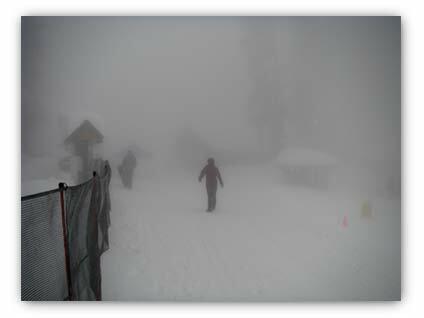 We used to call Mount Seymour – Mount See-less for this very reason. Loosing your balance on a piece of plastic sliding down a mountain is just not fun.